Loan-based Crowdfunding : Money for Each Other. Crowdfunding has become a popular topic for authors in both academia and journalism, as well as on this webpage. Commonly, crowdfunding platforms allows entrepreneurs to gain capital for their operations through either donations or by offering partial ownership of their companies, resembling venture capital. Over the last years, the number of participants in crowdfunding campaigns greatly increased. One of the explanation for the sudden popularity of this form of acquiring funds for one’s business venture is that commercial banks have become very reticent when it comes to providing loans for entrepreneurs and small businesses. While the bank has traditionally been the first party entrepreneurs-to-be turned to, the credit crisis and the subsequent stricter legislation installed by governments resulted in the situation that banks hardly provide any commercial loans below 500.000 euro. While the rise of crowdfunding is thus partly explained as an answer to the changed world wherein banks are highly reticent to provide loans below half a million euro’s, the types of financing that are commonly collected through crowdfunding platforms, donation-based and venture capital-like financing, are rather different from the common financing type collected through a bank, the loan. In response to this contrast, a young Dutch crowdfunding platform called Geldvoorelkaar (Dutch for ‘Money for each other’) introduced an alternative way of crowdfunding. Money is not collected by gifts or transferring parts of the ownership of the firm, but by requesting a loan. Loans can not only be requested by firms or people with a business plan, but also individuals who look to buy for example a car or new kitchen, but lack needed money needed for these purchases at the present moment. Geldvoorelkaar operates differently than the well-known crowdfunding platforms. 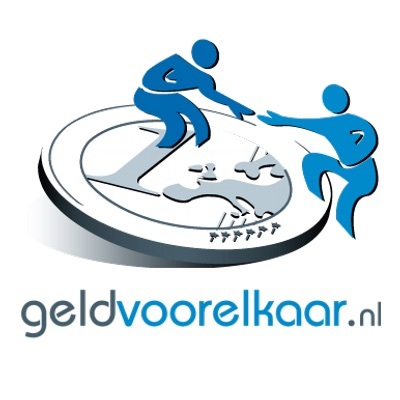 An individual or firm can file a request on the website of Geldvoorelkaar with the desired amount of the loan and the interest rate they are willing to pay on the loan. Geldvoorelkaar then checks the credit worthiness of the person or firm which filed the request. Apart from doing their own assessment on the risk of borrowing money the person or firm, Geldvoorelkaar assesses the creditworthiness of individuals and firms in cooperation with the Dutch credit assessor Graydon by a Probability of Default (PD) score and uses the Dutch Central Credit Information System to calculate a BKR-score, such that people considering providing a loan through Geldvoorelkaar can assess the creditworthiness and connected risk of the particular loan with three different, independent ratings. Geldvoorelkaar accept only the files with a PD score of B or higher. The maximum probability of default, as assessed by Graydon, allowed is 4.99%. The way in investors can contribute is similar to the common crowdfunding platforms. Investors can choose the amount which they want to provide, and have full control of their privacy options. The default privacy option is an anonymous contribution. An important difference though is that when the requested loan amount is reached, it is not possible for people to contribute more anymore. The loans made take the form of an annuity. When an individual or firm successfully collects its loan, every month it has to pay both the interest and a redemption sum, such that at the end of the term of the loan, the loan is fully paid back. This form greatly decreases the risk of default and provides investors with a steady income on their loaned money. It is extremely interesting to see this new form of crowdfunding unfolding. People can invest in exactly those people and projects they believe in, with a clear indication of the risk through various ratings and their reward, through the interest rates. This puts the ordinary man back in charge of what goes on with its savings, as opposed to the opaque ways banks and trust funds use the savings of the consumer they control. And on the other hand, I believe it is greatly promising to see that this new form of crowdfunding provides a solution to the problem that individuals and small firms are not able to get a loan at a bank. Overcoming this problem may very well turn out to be a great stimulus for entrepreneurship, innovation and, in the end, healthy economic growth figures. Earning money by providing some of your savings to an individual who wants to make an impact on your local society, how could one oppose such a beautiful thing!